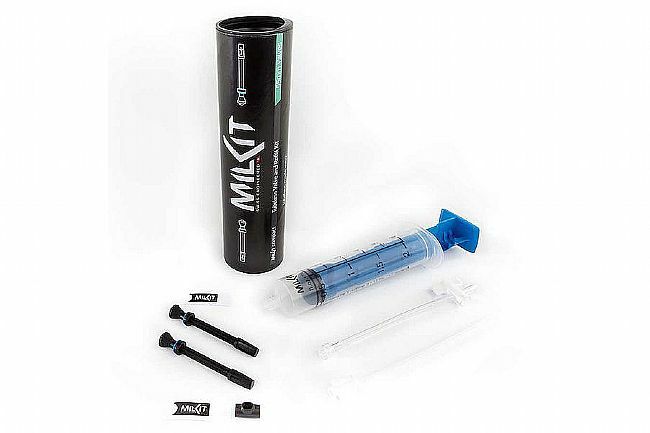 The Milkit Tubeless Kit is a clever valve system that makes installation and maintenance of tubeless tires quick and easy. First, screw out the milKit valve core (no air is lost due to closed rubber flaps). Then, Insert the milKit applicator through the valve to measure the sealant in the tire and assess how much extra sealant is needed. Next, inject sealant with the applicator, and finally, reinstall the valve core and get back on the bike. Includes: Two valves, valve core tool, measuring/refilling syringe. Compatible w/ all standard rims, tires, and sealants. For my first foray into the tubeless world I was looking for any advantage I could get. The Milkit system looked almost fool-proof. I watched instructional videos of successes and failures and re-read the instructions. WIth the Milkit valve, I was able to get my tubeless tire seated with a regular floor pump. It held 50 PSI with no sealant and no valve core. I then deflated the tire to 14 PSI per Milkit instructions. I filled the syringe with sealant, turned the flow valve off, inserted the injection straw through the Milkit valve and opened the flow valve. Unfortunately, my thumb was not covering the plunger and the 14 PSI in the tire ejected the plunger and 2 ounces of sealant from the barrel rather forcefully. After cleaning up, attempt 2 worked perfectly.